I am 49 today! Have a story and my process as a party favor. Hurrah! I became a Level 49 Human today and I’m in Chattanooga to celebrate my birthday with my parents. Mom is leveling up to 80 this weekend so we have a shindig planned. Meanwhile! I have a party favor for you. There’s a short story, “The Worshipful Society of Glovers” that came out last year in Uncanny Magazine. It’s free! But that’s only a little bit of the party favor. What I really have for you is how I developed the story. Now, you can do this one of two ways. You can go read the story first, and then come back and read the process OR you can read the process and then the story that came from it. There are going to be some spoilers, but not as many as you might think. 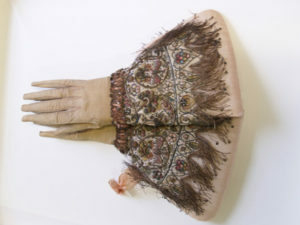 Make sure you check out their gallery of gloves which are goooooorgeous. Anyway, of all of the livery companies I looked at, this one stuck in the back of my head. 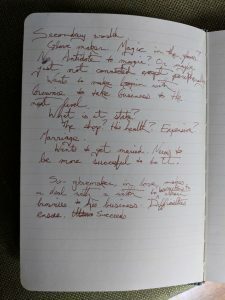 And at some point, I was on an airplane — shocking I know — and started noodling with the idea of magic worked into gloves. Glove maker. Magic in the gloves? No Antidote to magic? Or maybe just not connected except peripherally. Wants to make a bargain with brownie to take business to the next level. The shop? His health? Expensive? Wants to get married. Needs to be more successful to do it. So – glovemaker in love, makes a deal with a witch to learn how to attract brownies to his business. Difficulties ensue. Succeeds. For those of you who’ve read the story, you’ll note, as you take a look at this, that aside from “magic gloves” and “brownies” there’s basically no resemblance to the final story. 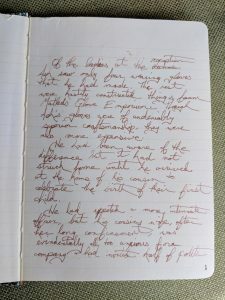 With that sort of rough sketch of an idea, I was still on a plane, so I started writing an opening scene. Of the ladies at the reception, Ash saw only four wearing gloves that he had made. The rest were hastily constructed things from Matled’s Glove Emporium. Though Ash’s gloves were of undeniably superior craftsmanship, they were also more expensive. He had been aware of the difference but it had not struck home until he arrived at the home of his cousin to celebrate the birth of their first child. I didn’t like it, although I don’t remember why… looking at it now, I would guess that it was more Austeny than I wanted to be for this. 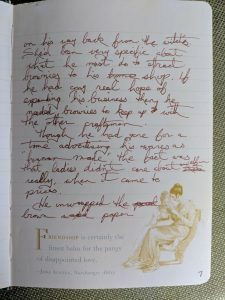 I was writing short fiction to take a break from the novels. Also, this is fairly distancing and taking too long to get to the point. Anyway, I was still on a plane, so I wrote a different opening. Ash laid the fine burgundy kid leather on the counter beside a spool of waxed thread. He marked a fine ladies glove on the leather, then stretched, trying to remember the words the witch had taught him. He felt a right fool talking to an empty shop, but with luck there were brownies about who would take the bait. “Perhaps if I eat something I will feel better.” His voice echoed off the glass front display cabinets. Ash picked up the parcel he’d acquired at the Kalred butcher on his way back from the witch’s. She’d been very specific about what he must do to attract brownies to his shop. If he had any real hope of expanding his business then he needed brownies to keep up with the other craftsmen. Though he had gone for a time advertising his wares as “human made” the fact was that ladies didn’t care about an elfin really, when it came to prices. He unwrapped the brown waxed paper and stopped as the stench of raw onion rose from the parcel, overwhelming the peppery tang of the corned beef. “No, no, no…” Ash crumpled the paper around the sandwich and ran it outside, hoping the stench wouldn’t linger. The witch had been very clear in her instructions. At this point, my plane either landed or I fell asleep and then lost the notebook for a couple of years. The idea though was still in the back of my head. So in February 2016, I used “Magic glovemakers” as the gee whiz idea in one of my Short Story Intensives. In this class, one of the things I do is to demonstrate how to go from random idea to an outline. Glovemaker – He needs money to afford to marry the woman he loves. What does the apprentice want? Why can’t he have it? The master won’t allow it. She’s in the workhouse to pay off his father’s debts. To make master so he can set up his own shop. From that, I write a 3 sentence summary and identify which MICE quotient element is at play. [event] An apprentice glovemaker wants his sister to come live with him, but she has palsy and is in an institution. He makes a deal with guild brownies to make the best quality gloves which he sells, unlicensed on the side. If he’s caught, he’ll lose his apprenticeship and wind up on the street. So knowing that it is an Event thread, because it’s a disruption of the status quo, that tells me where the story needs to start and end. So I add the opening and closing to my thumbnail. An apprentice glovemaker learns that the institution that his sister is in is mistreating her. He wants her to come live with him, but she has palsy and he needs help caring for her. He makes a deal with guild brownies to make the best quality gloves which he sells, unlicensed on the side. If he’s caught, he’ll lose his apprenticeship and wind up on the street. He successfully impresses the faerie queen and she invites them both to live in her court and work for her. Next… Single thread stories tend to be fairly dull, so I need a secondary conflict. Here, I look at the other available MICE elements. In this case, I went with Inquiry. Apprentice wants to figure out how to contract a guild brownie. Listens outside a journeyman’s lecture hall to get instructions. Ends manages to contract a brownie. I’m going to pause here to note that this was a mistake, because I know that I’m naturally drawn to character stories and should have looked for a character thread. BUT I was doing this as a demonstration for class and rushed it a bit. For purposes of exercise, I will flip the nesting to see which one is stronger. Flipped: An apprentice glovemaker’s has to figure out how to summon a brownie in order to pass the test to be a journeyman. Screwing up would put him on the street. Worse, his sister has palsy and is in an institution. When he visits her to try to make sense of the assignment, it becomes clear that she’s being mistreated, and he resolves to get her out. He listens outside a journeyman’s lecture hall to get instructions on how to contact a brownie. During the negotiations, something something, and the brownie says that his sister can stay in the Faerie Queen’s court. The apprentice decides that this is a better deal, and takes him up on the offer. Knowing that his sister will be safe, he signs the contract. Still with me? Great. Then I take the thumbnail and break it apart into a list. This is totally mechanical based on the sentences and phrases in the thumbnail. My goal here is to identify the pieces of information that I need to convey to the reader, or which the story will break. Nested: [Event] An apprentice glovemaker learns that the institution that his sister is in is mistreating her. He wants her to come live with him, but she has palsy and he needs help caring for her. His master keeps complaining that a guild brownie would be a better glovemaker. [Inquiry]This gives him an idea. He listens outside a journeyman’s lecture hall to get instructions on how to contact a brownie. which he sells, unlicensed on the side. If he’s caught, he’ll lose his apprenticeship and wind up on the street. From there, I expand it into a linear timeline, looking for plot holes or emotional beats that I might be missing. So, I expand, which looks like this. Nested: [Event] A journeyman glovemaker visits his sister and sees brusies. Realizes that the institution that his sister is in is mistreating her. Asks if he can take master test so he earn more money and bring his sister to live with him. His master is too cheap to give up a journeyman early, even though he is always complaining that a guild brownie would be a better glovemaker. Goes to main guild hall. Sneaks into restricted part of the library to get instructions on how to contact a brownie. Late at night, does the ritual to get brownie to show up. If he’s caught, he’ll lose his guild membership and wind up on the street. From there, I contract again to eliminate redundancies and begin to think about actual scenes. Just because something is on the linear timeline doesn’t mean that it needs to happen onstage. And the things that are onstage don’t necessarily have to be presented to the reader in the order in which they happen linearly. Although, this story is linear. But you can see how I trimmed this down to three scenes. [Event] A journeyman glovemaker sister has seizures and he needs help caring for her. Asks if he can take master test so he earn more money and bring his sister to live with him. His master is too cheap to give up a journeyman early and tells him to put his sister in a workhouse, even though he is always complaining that a guild brownie would be a better glovemaker. [Inquiry]This gives him an idea. He’s a damn good glovemaker. What if he asks a brownie to embue the magic, but he makes the gloves himself. It would mean working outside guild rules and if he’s caught, he’ll lose his guild membership and wind up on the street but his sister’s immediate danger makes it worthwhile. And now…. I unpack it again. One of the things that often stops me when I’m writing is figuring out the stupid mudane stuff like “What time of day is it?” So I use this little checklist that I got from Laurel Amberdine. 1. What the principle action of the scene is. What it’s doing to advance the plot. – To establish seizures. 2. Where it takes place – Tiny room back of glovemaker’s shop. 5. What does your main character want? He wants to stay with his sister. In the early morning, before going to work, JG and his sister are joking about how he never has time to make gloves for her. She has a seizure. He’s going to be late, again, but can’t leave alone. Asks if he can take master test so he earn more money and bring his sister to live with him. His master is too cheap to give up a journeyman early and tells him to put his sister in a workhouse, even though he is always complaining that a guild brownie would be a better glovemaker. This gives him an idea. He’s a damn good glovemaker. What if he asks a brownie to embue the magic, but he makes the gloves himself. It would mean working outside guild rules and if he’s caught, he’ll lose his guild membership and wind up on the street but his sister’s immediate danger makes it worthwhile. 5. What does your main character want? He wants to help his sister. Late at night, does the ritual to get brownie to show up. When it shows up, he makes a deal with guild brownies to add magic to the gloves. Brownie is impressed with his craftsmanship and agrees to add magic, which he will sell, unlicensed on the side and cut the brownie in on the profits. His first order — a pair of gloves to stop seizures. At this point I had an outline! He arrives late, and the master gives him grief, says that if his sister is interfereing, then maybe he should put her in an istitution. JG can’t afford that. GM says, maybe a poorhouse then. JG suggests that maybe the answer is that she should take the master test and then neither of them will have to deal with the contract. To himself, he thinks about setting up his own shop and hiring someone to watch his sister. His master is too cheap to give up a journeyman early, even though he is always complaining that a guild brownie would be a better glovemaker. This gives him an idea. He’s a damn good glovemaker. What if he asks a brownie to embue the magic, but he makes the gloves himself. It would mean working outside guild rules and if he’s caught, he’ll lose his guild membership and wind up on the street but his sister’s immediate danger makes it worthwhile. Late at night, JG does the ritual to get brownie to show up. When it does up, it is surprised to find a journeyman. He proposes a deal. Normally, the brownies make the gloves AND embue them with magic, he just wants someone to embue the magic. Brownie is impressed with his craftsmanship and agrees to add magic, which he will sell, unlicensed on the side and cut the brownie in on the profits. His first order — a pair of gloves to stop seizures. I also had a problem. Because I had a character with a disability that I was about to magically cure. She had no agency, was being entirely defined by her disability, and was simply a problem for my main character to solve. I knew that I had a problem, so I chatted with Michael Damian Thomas, who is not only the editor at Uncanny but is also the caregiver for his daughter, who has Aicardi syndrome. This is before I’d started writing the story — well… actually I had written the first scene as a demonstration for my class, but I hadn’t done more that. The first scene looked like this. Behind him, Sarah made a coughing grunt. Vaughn’s heart jumped sideways in his chest. Not again. He dropped the pastry and the gloves and spun, but not in time to catch her. Her chin cracked against the wood floor as she hit. Every muscle in her body had tightened and she shook, grunting with another seizure. Vaughn dropped to his knees beside her and rolled Sarah onto her side, brushing her hair back from her face. She couldn’t hear him when one of the fits came over her but he sang to her anyway, just because that’s what their mum had done. He was going to be late again, and damn it if Master [name] would be understanding about the reason why, but there was no way in Hell Vaughn was going to leave Sarah alone. You’ll note that I’m telegraphing the ending REALLY strongly there, by having Sarah flat out state what it is that she needs as a solution. This was part of what was reducing her to a single-issue character. Michael suggested some ways to address the problematic structural stuff. And he also pointed out that part of the problem was that “seizure” was a symptom, not a cause. Most of the things that cause seizures come with an expansion pack of other neurological things ranging from depression to migraines to synesthesia. Not only did I need to be more specific, I also needed to remember that no disability was simple. These weren’t single problems that could be fixed with a single solution. Theoretically, I know this. Mom has Parkinson’s. People think about it as just shaking. Did you know that Parkinson’s often comes with depression, paranoia, and eventually dementia? The number of medications a patient has to take in order to address the cornucopia of symptoms is truly staggering. That conversation was what unlocked the rest of the story for me. What I wound up writing is wildly different from where the story idea started. The final version of “The Worshipful Society of Glovers” is at Uncanny Magazine. And if you’ve made it this far… I’m doing the Birthday Fundraiser thing on Facebook, to raise money for Parkinson’s. Fascinating story. Thank you for sharing it with us! Love the tale of how the story came to be. And wishes for a most happy birthday! Hey, you’re supposed to be the one getting the presents on your birthday! This was a really, really cool present. The story is great, and without getting too spoilery, very moving and impactful. It genuinely has inspired some (ongoing) thought about morality, and how easy it is to judge when you don’t know people’s circumstances (or how is it is to turn a blind eye when you do). And then the breakdown of your process is like a second gift wrapped up in the first. Thank you. Happy Birthday! Happy Birthday, Mary! Love your work. I really want to see this project because I love learning about process. I was so excited to see this early this morning. Between the normal routines of my day, I spent the day reading through this, going back and forth to the story, and taking notes. This alone is such a cool gift. And just now, at the end of the day, I got to the Scrivener files! I could cry from happiness. You are most generous and deserving of the good things in life. Mary, thank you so much for sharing this! I really appreciate getting this look at your process. Happy birthday! Happy birthday! This was so interesting to me even though I don’t write fiction, since I am an inveterate process geek (and an enormous fan of your writing!). (1) What’s shared here is just the XML file that Scrivener uses to keep track of all the parts of the project — it doesn’t contain any of the text itself. On Scrivener for Windows, this is the file you “open”, but what Scrivener actually does is use this file as a guide for loading all the bits and pieces stored in subfolders of the project folder. On a Mac, that entire project folder appears as a single file (with a .scriv extension), hiding some of the complexity. But either way, the .scrivx file won’t work alone — the whole project folder needs to be shared (might be easier to compress it as a .zip first). (2) Because of the above, you don’t actually need Scrivener to open a .scriv file (on Mac) or view the contents of a project (on Windows). Inside, Scrivener stores everything in open formats (RTF, text — this is fantastic as far as writers retaining control of their work). The files may have names only a computer could love and you’ll miss out on Scrivener’s visual organization, so it will be like sifting through a shoebox of unsorted index cards and scraps of paper rather than a nice, tidy binder, but the text is there for your perusal. On Windows, it’s a matter of simply poking around inside the project folder once you download it. On a Mac, if you find yourself with a .scriv file (again, just a fancy folder), control-click (or right-click) it and choose “Show package contents…” to dig in. Only, looking at the Event section on the MICE chart, thought “Godzilla” more like a character problem (if Godzilla was the character). If Godzilla is your POV character, then yes. That’s not typically the case in the films, but it could be a fascinating retelling. That was a fascinating and enlightening look into your process. Thank you for sharing it!